Applications are available on the Plano Youth Leadership website: www.planoyouthleadership.org. Applications Due: July 15, 2018. The purpose of the program is to encourage students to become members of the Texas Army National Guard, the Texas Air National Guard, the Texas State Guard or to become commissioned officers in any branch of the armed services of the United States. The program is open to Texas high school students who meet a high level of academic achievement. For more information: Matt Shaheen, State Representative, Collin County - District 66, district office, (469) 642-8708. Two scholarships will be awarded in the amount of $1,000 each on Thursday, May 2, 2019, during our annual Senior Reception Day at Andrews Elementary. Applications Due: Wednesday, April 17, 2019. Shall be a Plano ISD graduating senior. Shall have attended 5th grade at Andrews Elementary School, Plano, TX. Shall enlist in the military, enroll in an accredited 2- or 4- year college or university, or enroll in a vocational or technical institute in the summer of fall semester immediately following the applicant’s high school graduation. An acceptance letter or other verifiable confirmation will be required before the check can be released. Shall submit to the Andrews Elementary PTA one (1) letter of recommendation from a present or former teacher. Shall NOT have an immediate family member on the Andrews PTA Scholarship Committee. The scholarship will be awarded on May 2, 2019, during the annual Senior Reception Day at Andrews Elementary. Provide one-page essay about their time at Beverly demonstrating how Beverly prepared them to be a successful and productive citizen and/or student. Applicants who meet all the criteria will have their names placed in a drawing and the winner will randomly be selected at the Senior Reception. Scholarships are restricted to graduates during the year of the award. Applicants must have attended Boggess Elementary for at least two years of their elementary education. Award winner must attend an accredited college, university or technical school. The applicant shall be free of legal entanglements, which might defeat the purpose of the award. Any student known to be receiving a full scholarship for tuition shall not be considered for this award. The scholarship is available to any graduating senior who meets the above criteria, not just seniors at Plano East High School. More information can be found by visiting www.boggesspta.org or by contacting a member of the Boggess PTA Board. enrolling in an accredited undergraduate degree program at a college or university for the 2019-2020 academic year with a minimum of 12 credit hours per semester. Applications must be postmarked no later than March 29, 2019. For more information: www.brinkerpta.org under the "PTA Forms" section on the right hand side of website. Available to any PISD graduating senior who attended Carpenter Middle School for at least two years and plans to attend a 2- or 4-year accredited college, vocational, or technical school with a minimum of 12 credit hours per semester or enlist in the military by the fall semester immediately following their high school graduation, and has a minimum GPA of 2.5. Submit an essay answering the following question:Write an essay describing how attending Daffron had an impact on your life and/or education. Winner of Daffron Scholarship will be announced at the Daffron Senior Reception on Wednesday, May 1, 2019. Describe a challenging situation you experienced while at Dooley and how a teacher, mentor, or faculty member helped you through it. How did that person affect your beliefs, worldview, and future goals? If you were an educator, how would you apply this tactic to your students? If you could travel back in time and talk to your younger self at Dooley elementary, what would you say? What kind of advice, encouragement, or suggestions would you give? How did your experience at Dooley shape you into the person you are today? Winner of Dooley Scholarship will be announced at the Senior Class of 2019 Senior Class Reception on Thursday, April 25. Hickey Elementary PTA does not offer a scholarship. Rather, their PTA gives out Door Prizes at the May reunion to graduating Seniors who attended Hickey Elementary. A personal history including extracurricular activities, awards, etc. Be a United States citizen or hold permanent residence status. Minimum GPA 3.0 or 2.75 from a PISD senior high school campus in June 2018. Finalists will be interviewed and scholarships will be awarded at each high school's senior awards night. A $500 scholarship will be awarded to two (2) students who meet the requirements listed below. Student must attend a college/university or vocational program for Fall, 2019. Transcript or VOE must be attached. No exceptions. Winners will be drawn at the general PTSA meeting in May. Must have attended McMillen in 9th and 10th grade and a PTSA member both years. Students are not required to apply. Scholarship recipients are randomly selected from all eligible students. Applicant must be a graduating high school senior from a Plano ISD school. At least one of the applicant’s parents must have been a member of the Rice Middle School PTA for at least two of the three years you attended Rice Middle School. Applicant must plan to be enrolled and attend full-time in an accredited college or university or a technical institute in the summer or fall semester immediately following high school graduation. Have a parent who was a paid PTA member while the student was in 6th, 7th, and 8th grade at Robinson Middle School. Be a 2018 graduating senior from a Plano Independent School District school. Attend a college/university or vocational program for Fall 2018. VOE or transcript must be attached. No exceptions. A winner will be drawn at the Robinson Middle School General PTA meeting on May 17, 2018. The applicant exited their fifth grade year at Shepard Elementary. The applicant is a graduating senior in the spring semester that the scholarship is being awarded. The applicant shall provide proof of acceptance to a college, university or community college. Will attend an accredited college or university or a technical institution in the summer or fall immediately following graduation, with attendance beginning on or before September 15, 2018. Applications must be received by Friday, May 4, 2018. Application may be dropped off or mailed to Shepton High School, Attn: Rhonda Snyder, Shepton PTSA President, 5505 Plano Parkway, Plano, TX, 75093. 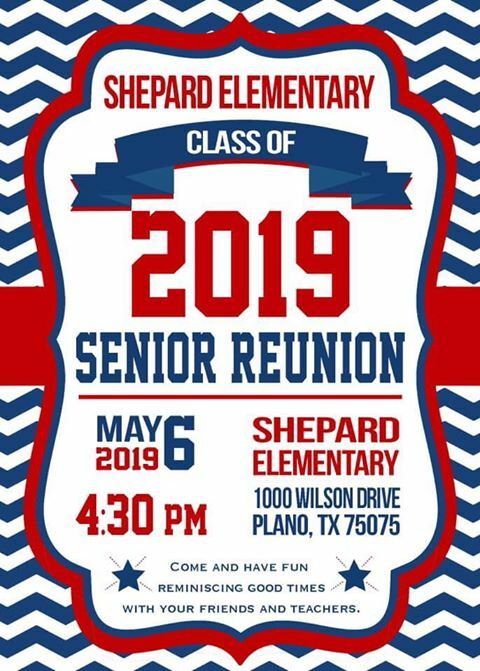 Any graduating senior enrolled in Plano ISD who attended Stinson Elementary School. Student enrolling in an accredited undergraduate degree program at an accredited college or university for the 2019-2020 academic year (minimum of 12 credit hours per semester). Two $500 Scholarships will be awarded. Application deadline is April 20, 2019. Applicant must be an alumni of the Wells Elementary School. Applicant must have attended Wells Elementary School for five or more years. Applicant or applicant’s parent/guardian must have been a member of Wells Elementary PTA for three or more years. Applicant must be enrolled in an accredited college or university immediately following his/her high school graduation. Please contact wellsptapresident@gmail.com for more information.